"Talk Derby to Me" was the slogan I saw all over Louisville, Kentucky. I considered myself very lucky to be visiting during Kentucky Derby weekend thanks to one of my best buds Gwen who invited me down after we had finished finals. We bought general admission tickets for $40 and even though we couldn't actually see the track and couldn't afford an actual seat (tickets range from $300-$500 each), we were excited because we were inside Church Hill Downs on Derby day. We spent most of our time around the Paddock Area, which is where they bring the horses out before each race and a giant tv screen that shows all the races and odds. We also went to the infamous infield for 5 minutes, but we were definitely overdressed in our sophisticated dresses and hats. So we pretended we had box seats instead. I watch the Derby every year on tv with either my family or Ryan. Ryan and I won big a couple years ago on Mine that Bird, but we haven't had any luck since. I have been to horse race track before, Ryan and I like to go to Arlington, (the race track nearest us) at least once during the summer. He's a little intense for me haha. He likes to do all the trifectas and other very complicated bets I never knew even existed. I'm sure this would disappoint my grandpa who would also like these bets and studying the book to look at jockeys and trainers. I like to pick based on the names and the underdogs. Of course I bet on the wrong underdog during the Kentucky Derby race yet again. However I actually was able to cash in a little bit on a different race. We were looking through the booklet and my eye caught on a horse named Sassy Image- I just had to bet on it just for the sake of the name alone. When I finally made it up to the counter, there was literally a minute before the race started. I made a $6 bet across the board- which means I make money if the horse places in 1st, 2nd, or 3rd. Sassy Image was also considered a definite underdog. He had the worst odds 16-1. However, I would make my grandpa proud because I saw that he was good at winning on a wet track, and since it just rained for a half hour I knew I had to put something down. AND THE RACES WERE OFF! We watched the race on the television immediately after stepping away from the counter. It truly felt like a Seabiscuit or Secretariat moment, sure only $6 was at stake- but for a poor college student that's a couple of drinks. Sassy Image came out of no where and placed 1st. None of us could believe it. I had turned a $6 bet into over $50. So even though Animal Kingdom ruined any of my winnings on the actual Derby race- I still considered myself a sassy and classy winner. I really had a great time and hope to go back again next year. The official drink of the Kentucky Derby is called a mint julep. I am not a fan of hard liquor, so this was not my favorite. This is for you bourbon fans. 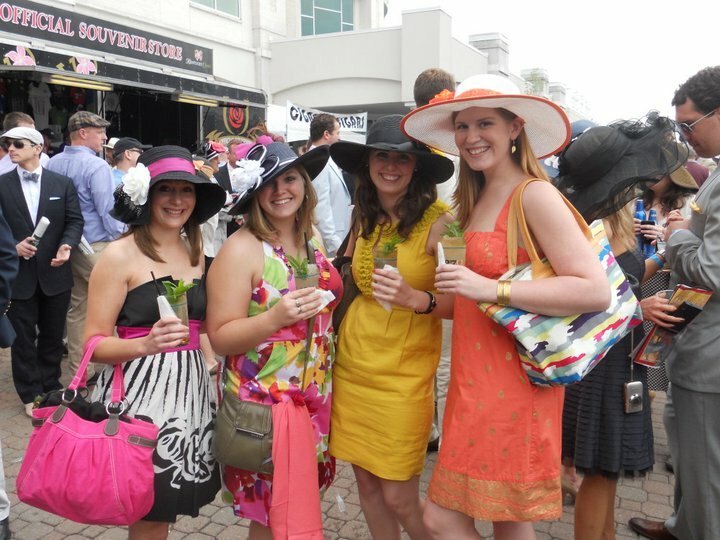 However, I loved the Kentucky Oaks drink (which is the races the day before the Derby), which is called the Lily. It's kind of like a sweet cosmopolitan. 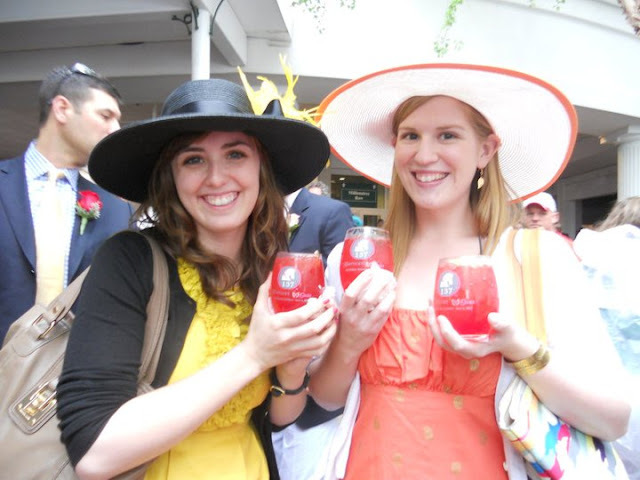 So here is how to make the official Kentucky Derby weekend drinks! Make one julep at a time by filling a julep cup with crushed ice, adding one tablespoon mint syrup and two ounces of Early Times Kentucky Whisky. Once the ingredients are mixed, place the Oaks Lily® in a tall glass with crushed ice, add a straw and garnish with an orange wedge and cherry. Sorry it's been so long since I posted, but due to absolute chaos, I haven't been on my computer much. I had a horrible cold all during finals week and then my cousin is currently hospitalized for a serious brain AMV. However, on the bright side I was able to go to the Kentucky Derby in the middle of the chaos. As I am sitting in the hospital waiting room- I thought it would be a good idea to remain positive by reflecting on a happy memory last month. For the royal wedding, my friend Katy and I decided to make a bunch of fun London themed treats. I decided to make lemon cream scones. She made red velvet cupcakes with cream cheese and decorated them with blueberries. I was one of those people up at 4 am to watch the wedding- I couldn't miss out on the wedding of the century or resist watching the crazy hats. Even though I don't know Kate Middleton and Prince William personally, I believe you're entitled to letting your hopeless romantic side out every once in awhile. With all the horrible news in the world, it's nice to see the world celebrate something that involves eternal love and happiness. I wanted to do scones because they remind me of my time in London last summer. My favorite place in all of London is the Orangery. It's a little tea restaurant in Kensington Palace which is in the middle of Kensington Gardens and just absolutely gorgeous. I ordered the signature orange tea with finger sandwiches, scone and tart. It was a relaxing and quiet afternoon that I will always remember. A moment of complete peace in middle of the city chaos. So here's a recipe for scones fit for the Queen. Preheat oven to 400 degrees. Line a baking sheet with parchment paper. In the bowl of an electric mixer fitted with the paddle attachment, combine flour, butter, sugar, baking powder, and salt. Mix at low speed until the mixture resembles wet sand. In a separate bowl, whisk together 3/4 cup cream, 2 eggs, lemon zest, and vanilla. Add the cream mixture to the flour mixture, and beat on low speed until just incorporated. Turn out onto a lightly floured work surface, and form into a flat disc, about 8 inches across and 1 1/2 inches thick. Cut into 8 wedges and transfer to prepared baking sheet. In a small bowl, whisk together remaining egg and 3 tablespoons cream to make an egg wash. Brush scones with egg wash, and sprinkle with sugar. Bake until the tops are golden brown and firm, 40 to 50 minutes.